Globus pharyngis is the feeling of having a pill stuck in your throat, despite not having taken one. The sensation can also be described as feeling you have a lump or something caught in your throat. Other perceived symptoms may include the sensation that you are not breathing okay or are having difficulty swallowing food and water. However, if breathing and swallowing food and water occur normally, these are not true symptoms. If symptoms such as pain and difficulty swallowing do indeed occur, it is important to see a doctor as soon as possible. The feeling of having a pill stuck in your throat even though you’ve not taken any can have multiple causes. Often times, it’s the accompanying symptoms or lack of that can indicate whether or not there may be an underlying condition. In any case, if you experience a lump in your throat feeling or feel like there is a pill stuck in your throat, the first and most important thing is to see your doctor and have tests to rule out any existing conditions. So what causes a lump in throat or pill stuck in throat feeling? 1) Injury. 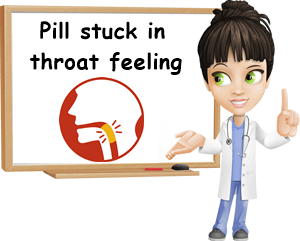 Trying to swallow a pill or tablet can occasionally hurt the sensitive lining of the esophagus because pills and tablets are denser and may not always have a smooth passing. Even a small scratch can cause a feeling of a lump or something caught in the throat that apparently gives you swallowing difficulty or that you feel is there all the time. This feeling can linger for days, until the esophagus heals itself. And any dry or hard food you may eat can further delay healing, resulting in the feeling of a pill stuck in throat persisting. The best solution is to have a drink of water to ensure your medicine or dietary supplements passes smoothly along the esophagus. 2) Problematic foods. Toast, bread crumbs, bread crust, fried foods such as chicken wings or anything fried in a coating of flour or bread crumbs, cereal flakes, muesli, crisps, popcorn, dehydrated bananas, nuts or baked goods made with walnuts, pecans etc. can all scratch the esophagus and cause a feeling of something caught in the throat. How to tell if it’s just a feeling or if there is something actually caught in your throat? Well, as long as you successfully swallow food and water and can breathe, it means it’s more likely the dry or hard food has injured the esophagus lining, hence the sensation. 3) Gulps of food and eating too fast. Foods is moved down along the esophagus and into the stomach by means of peristaltic movements of the smooth muscles. What this means is that the smooth muscles of the esophagus contract and relax to create a wave-like movement that pushes food down. But they can only work efficiently with limited amounts of food. Filling up your mouth and trying to swallow gulps of food one after the other can make it hard for the esophagus muscles to clear all the food at once and a second wave of peristaltic movement may be needed until all food is passed down into the stomach. This can result in injury of the sensitive throat lining, especially if food is poorly chewed or create an imprint of something stuck in the esophagus that may linger for some time. Eating slowly, taking small bites and chewing food well as well as alternating eating with drinking still or sparkling water can help. 4) Dry throat. Whether you have to swallow food or a medicine, a dry throat is more likely to suffer small injuries as neither softer food, nor denser tablets slide easily on a dry throat. This can leave a pill stuck in throat sensation that can last for days. It is best to drink some water before swallowing any pill or tablet. 5) Respiratory infection. Having a respiratory infection can cause dry, sore throat, vocal cord and throat inflammation and a temporary difficulty in swallowing food. Chances are, taking medicine or simply eating could produce small tears in the already inflamed and sensitive mucous membrane and leave a sensation of a pill or something else stuck in the throat, despite you being able to swallow food. 6) Acid reflux. Gastroesophageal reflux disease (GERD) can cause a feeling of food stuck in the throat or esophagus or a sensation of food stuck in the chest. How? Well, when you have acid reflux, stomach juices travel up into the esophagus and even mouth and can produce a burning sensation or lump or pill stuck in throat feeling. Another possibility is eosinophils, a type of white blood cell residing in the stomach and dealing with parasitic infections, escapes into the esophagus along with gastric juices and cause inflammation and a sensation of something stuck in the throat. Taking antacid medication and revising diet and lifestyle are the best treatment option for acid reflux (read more about what foods to eat and to avoid for acid reflux). 7) Postnasal drip. When mucus drips from the nasal cavity in the back of the throat, it can stay there for a while and become thicker. So when it is finally ingested, it can create a sensation of a pill stuck in the throat. The more congested you are (because of allergies, a respiratory disease or other causes), the more mucus you will produce and the more likely it is for a globus sensation to occur. 8) Anxiety or depression. When you have anxiety or even depression, you are more likely to focus too much on some things, worry about them being abnormal and eventually put yourself into a state of tension that causes sometimes normal sensations to appear pathological. For example, you may start hearing your heartbeat all the time and end up believing it might not be normal for some reason. Similarly, you might believe something is wrong when you try to swallow food and then start swallowing on purpose to check if everything is alright. After some time, the tension generated from an unnatural and repetitive action may become uncomfortable and result in a sensation of a lump or something stuck in your throat. It can help to see your doctor and rule out any underlying condition and keep working towards overcoming your depression and anxiety. 9) Physical abnormalities. A hiatal hernia is when the the top part of the stomach escapes through the diaphragm muscles into the middle of the chest cavity, causing acid reflux and symptoms such as heartburn, chest pain or a feeling of a pill stuck in the throat or food caught in the throat. Rings in the esophagus can also cause the sensation of something stuck in the throat or difficulty swallowing food. If they become bothersome, esophagus rings can be dilated to make more room for food to pass into the stomach. A stricture in the esophagus or physical abnormalities of the thyroid can cause a lump in throat sensation with difficulty swallowing and require a visit to the doctor’s office. Below is an interesting video depicting the main phases in the swallowing process. 10) Scar tissue. Acid reflux can, in time, cause extensive scar tissue in the esophagus. When scar tissue replaces normal esophagus tissue, it not only affects peristaltic movements of the smooth muscles transporting food down into the stomach, but also increases the risk for more serious conditions such as esophageal cancer. – Achalasia of the esophagus. The smooth muscles of the esophagus stop working properly which also affects the ring of muscles that open and close to let food pass into the stomach. Achalasia can occur for no apparent reason, or be caused by acid reflux, scar tissue from gastric juices escaping into the esophagus. It increases the risk for esophageal cancer. – Esophagitis. It refers to the inflammation of the esophagus and can be caused by bacterial, viral, fungal infections or allergic, autoimmune or other causes. It can be acute or chronic and result in ulcers. Symptoms include pain when swallowing, acid reflux, heartburn, food stuck in throat sensation etc. It requires a visit to the gastroenterologist for diagnosis and treatment. – Motor diseases, or nerve and muscle diseases. Examples: muscular atrophy, motor neurone disease or ALS, amyotrophic lateral sclerosis, progressive muscular atrophy etc. – Laryngeal cancer. Most common in smokers and those who drink alcohol regularly, increased risk for anyone with a previous or existing head or neck cancer. Typically, symptoms to look out for include unusual hoarseness, sore throat, wheezing, cough, pill stuck in throat sensation, lump in the neck, difficulty swallowing food or water, halitosis. If you experience several of these symptoms, see your doctor for a diagnosis. 1) Drink water before taking your medicine or dietary supplements. 2) Take pills or tablets with plenty of water. 3) Do not eat or take medicine lying down or with your head tilted back. It is recommended to slightly lean head forward to avoid too tense throat muscles. 4) Ask your doctor if you can crush and mix your medication with water, honey, fruit juice, yogurt or a dessert like applesauce. 5) Avoid taking pills in a hurry, when there is commotion around you or you are not sitting upright. Conclusion. 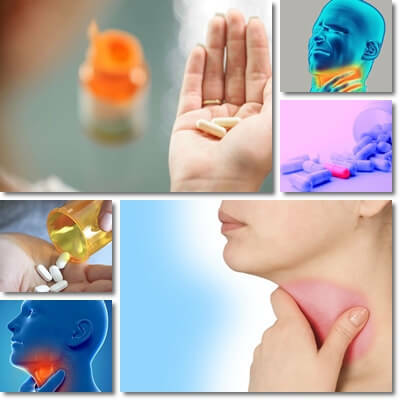 A feeling of a pill stuck in the throat can be merely a perception and occur after trying to swallow medicine tablets or a dietary supplement pill, even dry, hard-textured food and should pass in a couple of days at most. It can occur by itself, as a result of anxiety or depression. However, if you experience a lump or something stuck in the throat along with difficulty swallowing or pain when swallowing, hoarseness, wheezing or sore throat, especially if you have a history of acid reflux, it is important to make an appointment with your doctor and have some tests to rule out any underlying disease. What should I do if I am taking medication and the pill get stuck? I am not choking and can still talk but I can feel the pill moving in my throat when I breathe now. 5 days so far. Hello, Ronald. If so long has passed and you can breathe well and eat and drink, then it’s likely the pill has passed into the stomach. So it’s no longer there, it’s not stuck in the throat. But it may give you this impression because it may have hurt the esophagus. Sometimes, larger pills, tablets which are more difficult to swallow, not drinking enough water or not drinking some water before swallowing the pill can scratch the sensitive esophagus lining and make it seem like the pill is still there. (It’s happened to me so many times!) But it’s usually not anymore. It may take some days for the mucous lining of the esophagus to heal and for the pill stuck in throat sensation to pass. Try to east softer foods, avoid dry foods to hurry the healing. And drink some water before you take a supplements or medication next time to avoid this situation. And remember: as long as you can swallow food and water as you normally do, the pill is not stuck. For your peace of mind, you can always have your doctor take a look and reassure you everything is okay. Hope this helps! Ok, thank you, this was reassuring! I still feel like the pill is still stuck in my throat, however, i suspect it kinda scratched my esophageal smooth muscles bec I undoubtedly felt the large capsule went down horizontally across my throat, instead of vertical.. It was an unusually large vitamin pill that I had to take + anxiety. I can swallow and drink and breathe normally, too! It’s just the annoying feeling that the pill is still there and it feels scratchy and there is an aftertaste of the medicine. Sometimes pills just seem to turn horizontally and become really difficult to swallow, causing us to feel as if they’re stuck in the throat when they’re really not. This sensation may persist for a couple of hours to a few days. But as long as you can breathe okay and swallow water and food without any issues, know it’s just a feeling and it will pass. What helps me whenever I have to take a pill, whether vitamins (a lot of Omega-3 supplements tend to be quite large) or something else, is to have a couple of sips of water first. This really helps the pill slide better after. Sometimes I find it helps to eat after because food passing down into the stomach again and again seems to dull down the feeling of the pill stuck in my throat. You can try to take your pills with naturally sparkling water – it really helps things pass along better, whether food or pills. Hope this helps and wishing you lots of health, Camila!